Rich in local history and bursting with wildlife, Barstobrick offers a cultural, active day for all the family. You can enjoy a wide range of walks, easy grades, around a network of wildlife ponds to a more strenuous hike up to Neilson's Monument on Barstobrick Hill. The Visitor Centre is fully staffed and easily accessible, providing exhibition space, Farm shop, Coffee Shop and the Public Toilets attached to the Centre are open daily. With access to excellent bridleways, hills and countryside at Barstobrick you can also explore the area on horseback. 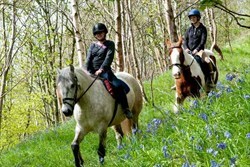 We have a range of horses and ponies and can cater for beginners as well as experienced riders. Our rides range from 30 minute introductory rides for children, to 1 and 2 hour treks. Pony trekking rides are available all year round. The 16 stable livery yard offers all kinds of livery including facilities for you to bring your horse on holiday. The Equestrian Centre has a 60m x 25m indoor area, sand and rubber surface and an outdoor warm up area along with lights, members room and loos. The air, water and land around Barstobrick are bursting with an abundance of wildlife and you’re welcome to come and explore. Undoubtedly the most spectacular sights are the Red Kites which soar through the skies as they catch the up draughts from the surrounding hills. There’s also Lapwing nesting on open hilly areas, Mallards in the pond and in late Spring you’ll spot brightly coloured Dragonflies darting across the wetland. The wetlands and ponds provide rich and valuable habitats for a range of rare and endangered species of plants and animals. In Spring and Summer the wetland comes to life with Ragged Robin and Common Heath Orchids thriving in the damp conditions. The blooms attract an abundance of butterflies and the Orange Tip, Green Veined White and Common Blue are all regular visitors to the marsh. Several species of waterbirds including Moorhen, Coot, Grey Heron and Water Rail can all be spotted nesting and feeding around the ponds. The network of wetlands also provides an excellent breeding habitat for other birds such as Reed Bunting and Sedge Warbler. Watch this space for details of other species thriving in Barstobrick’s vibrant environment. Several species of waterbirds including Moorhen, Coot, Grey Heron and Water Rail can all be spotted nesting and feeding around the ponds.